The Strategic Instruction Model (SIM) promotes the effective teaching and learning of critical content by helping teachers identify and use proven learning and planning tools, as well as providing students with a set of skills that will help them learn critical content, or “learn how to learn”. These strategies support students in middle school as well as throughout their academic careers. Learning Strategies (LS) are focused interventions for students who are struggling and have fallen behind their academic peers. 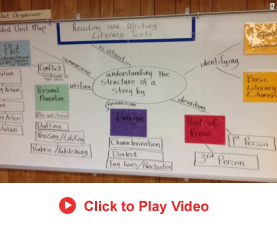 They are designed to provide the foundational skills that students need to learn content. The LS toolkit encompasses strategies for acquiring information from the printed word, for organizing information, for solving conceptual problems and for expressing information in writing. LS are provided in targeted intervention courses as well as integrated into content courses to help struggling learners catch up and achieve at and beyond grade level. Through Content Enhancement Routines applied consistently in every classroom and Learning Strategies that give added supports in the critical foundation skills for struggling learners, the tiered approach of the SIM toolkit provides a powerful and evidence-based platform for whole-school transformation and improved student outcomes. By incorporating SIM tools into a whole school model for effective teaching and learning, RAISEup Texas schools are improving outcomes for all students.